The president who is on an extended vacation in the UK spoke with Governor Abdullahi Umar Ganduje on Wednesday, February 22 on phone where he thanked Nigerians for all the prayers. Vanguard reports that the president spoke for about three minutes in vernacular with Governor Ganduje, while a prayer session was going on at the Government House in Kano. When Ganduje inquired how he was doing, Buhari said “Alhamdulillah (all praise be to Allah)”. The prayer session was broadcast live by local radio stations in Kano and Governor Ganduje told the President that Islamic scholars and Imams in Kano were praying for his speedy recovery. Buhari replied: “Maa shaa Allah”, meaning, “God willed it. H.E @GovUmarGanduje speaking with H.E @MBuhari on the phone earlier today during a special prayer session organized by Kano State Govt. He expressed the hope that Allah will accept the prayers and appreciated the efforts of the Islamic scholars who were praying on his behalf. 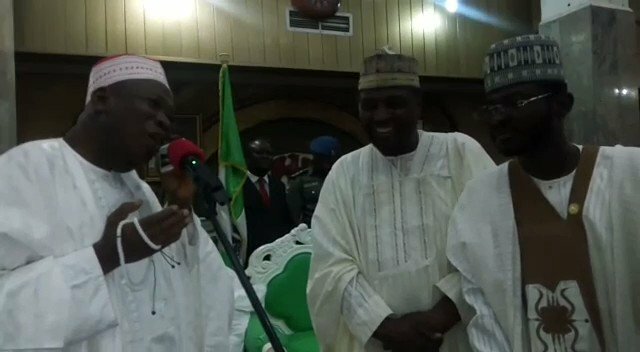 Ganduje said the president’s voice indicated that he was better and expressed hope that he will be well soon. A day ago, President Buhari revealed that he needs a longer time to rest, thus putting paid to speculations and claims by top government officials that he is actually fit and healthy. The president said this on Tuesday, February 21, 2017 saying the rest is deserved following the results from the series of medical tests he carried out in the United Kingdom where he is on vacation.